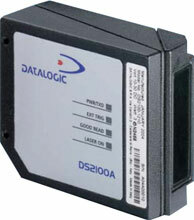 The Datalogic DS2100A has been discontinued. No direct replacement is available. Innovation and speed. Combining these simple but powerful ingredients ensures that the Datalogic DS2100A laser scanner satisfies the most advanced needs of a wide range of users, from OEMs to industrial and materials handling operators. The DS2100A has been developed focusing on the realistic requirements of its target markets and the outstanding result is a compact, cost-effective and easy to use industrial scanner.